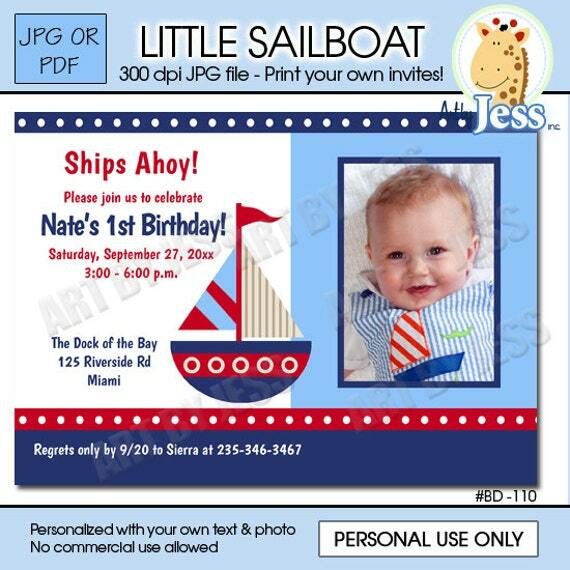 These are super cute and colorful Little Sailboat invitations for your child's next birthday. We will include your own wording, the AGE of your child (changed to your child's age) and a photo of your child that you provide us after making your purchase. This is for a DIGITAL file that you will print, not a printed invitation. You will email us your information and photo, and we will add it to our template just like the sample. You can then print the invitations from your home printer, or any office store / drug store! This is a very easy and affordable way to get personalized birthday invitations! 1. Choose your file from the drop down menu and "add to cart"
**** You can choose from 4x6 size or 5x7 size invitations. For a file that you can easily UPLOAD to websites like CVS, Target, Walmart, Vistaprint etc.... choose JPG FILE. If you prefer to print at home on cardstock or photo paper and trim yourself, choose PDF file. The invitations will come 2-to-a page to save you money! 3. Orders will be processed in the order in which they were received, and sometimes can take up to 48-hours. All orders are processed on BUSINESS DAYS M-F only. We will send you the high-resolution file for print. You can print right from the file you received, or if you have changes, let us know and we will send another one for print. We will make 2 complimentary changes. Our cute party pack has everything you need to finish off the party! All artwork is © Art by Jess / Allpetscherished and may not be copied, resold, or shared.